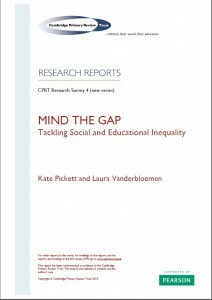 Pickett, K. & Vanderbloemen, L. (September 2015) Mind the Gap: Tackling Social and Educational Inequality. York: Cambridge Primary Review Trust. A survey of evidence on (i) the nature, causes and extent of social inequality and disadvantage experienced by young children in Britain or more specifically England, especially but not exclusively children from birth to the end of primary education; (ii) the relationship of such inequalities to, and their and impact on, children’s education, health, wellbeing, employment, economic and life prospects; (iii) the impact of policy initiatives devised by successive UK governments to address these conditions; (iv) alternative policy options from UK evidence and/or other countries; (v) ‘best fit’ recommendations for UK social and educational policy and practice. Kate Pickett discusses Mind the Gap’s evidence and Corbyn’s vision for education here.